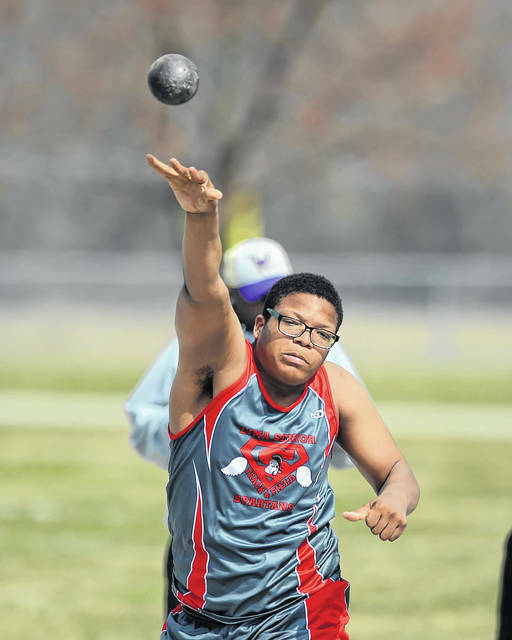 Lima Senior’s Jarran Ingram competes in shot put during Saturday’s Lima Spartan Track and Field Invitational. 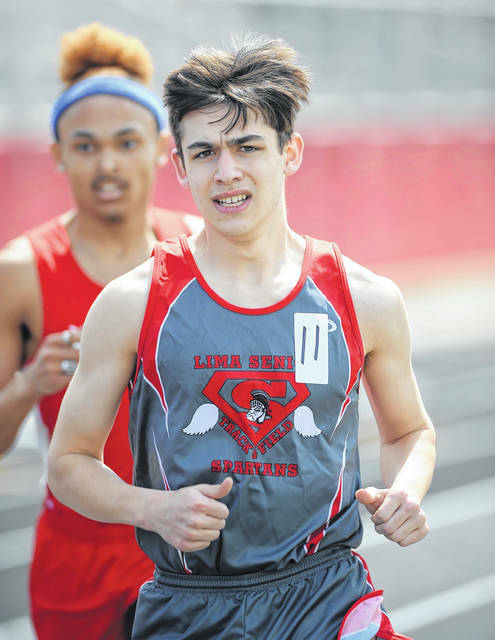 Lima Senior’s Anthony Lutz competes in the 1600 meter run during Saturday’s Lima Spartan Track and Field Invitational. Lima Senior’s Emalea Collins competes in the 1600 meter run during Saturday’s Lima Spartan Track and Field Invitational. Lima Senior’s Elyse Kelley competes in the 100 meter dash during Saturday’s Lima Spartan Track and Field Invitational. 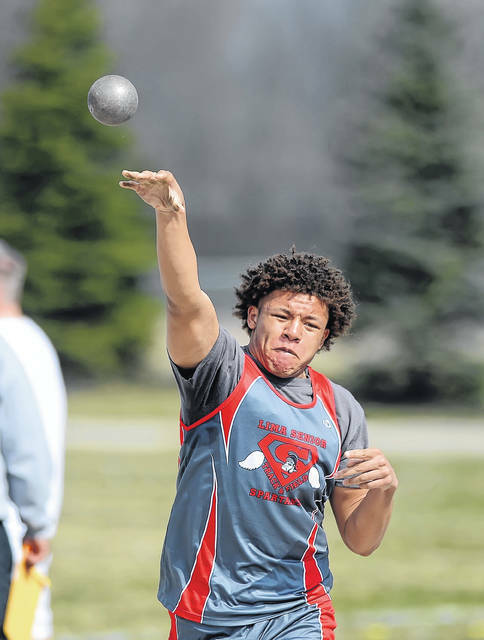 Lima Senior’s Devonte Horton competes in shot put during Saturday’s Lima Spartan Track and Field Invitational. LIMA — With the graduation of several key athletes from last year’s very successful track-and-field squad, Lima Senior girls head coach Emmanuel Curtis did not want to put any pressure on this year’s young team. However, after notching its third trophy of the young season with a close third-place finish at Saturday’s 37th annual Lima Spartan Track and Field Invitational at Spartan Stadium, the bar might have been raised a little bit. The Spartans (87) finished one point behind second-place Sandusky (88) and 33 points behind first-place Sylvania Northview (120) in the 11-team field Saturday. Toledo Central Catholic (85) and Toledo Bowsher (82) were not far behind the Spartans. On the boys’ side, Sandusky won the team title, outdistancing second-place Sylvania Northview 141-114. Toledo Central Catholic (93), Ponitz Career Technology Center (89) and Toledo Bowsher (74.5) rounded out the top five squads. Lima Senior placed sixth in the boys’ competition. Last season, a very experienced Lima Senior girls’ team finished second at the Spartan Invite. The Lima Senior program (girls and boys) stresses the importance of competing not only in the spring, but during the winter months. “We have a core (of athletes) who have been a part of our winter indoor program; and they know it’s very important to have a solid indoor program,” Curtis said. 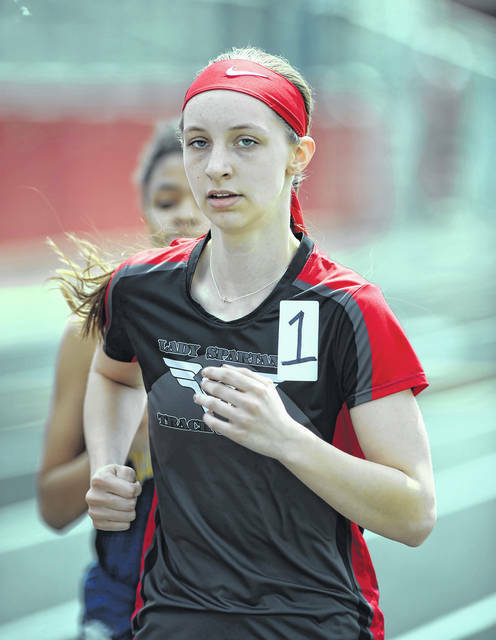 Senior Elyse Kelley, who is heading to Ursuline College next school year to compete in track, scored big points for Lima Senior on Saturday. Kelley finished third in the 100-meter dash (13.21 seconds), fifth in the 200 (27.04) and was part of both the winning 800-meter relay (1:47.50; Ka’Niyah Stevens, Deji’Ona Shurelds Simpson and India Benton) and 1,600 relay (4:06.14; Stevens, Benton, Shurelds Simpson). Kelley is the eighth Lima Senior female track athlete in the past two years to move on to compete at the college level. 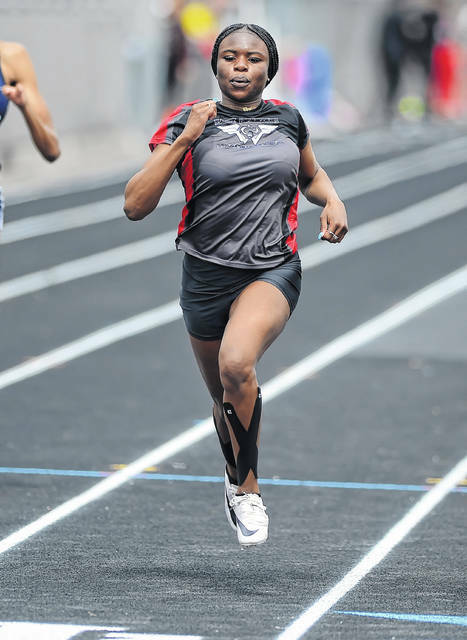 Lima Senior sophomore Deji’Ona Shurelds Simpson won the 400 meters Saturday in a personal-best time of 58.04. Her previous PR in the 400 was 59.5, set last season. Shurelds Simpson also finished second in the 200 (26.29) and was part of the 800 relay and 1,600 relay Saturday. “It (the weather) was way better today,” Shurelds Simpson said after winning the 400. “So, I felt like if I just went out and did it, I’d get the time that I wanted. In the 100 hurdles, Lima Senior freshman Lynnae Wheeler finished second (18.11). On the boys’ side, Lima Senior also boasts a young squad. “I have one senior, seven sophomores and five freshmen,” longtime Lima Senior boys coach Stephen Carter said. “But it’s promising. You have a lot of kids who come up and hopefully will step up in the near future. With the young talent, you just have to keep developing it. … They’re going to get better.